Redhill Football Club were formed in 1894. For the 1st few seasons as a club, the club were only playing friendly matches before joining the South Suburban League in the 1898-99 season where they finished 6th. 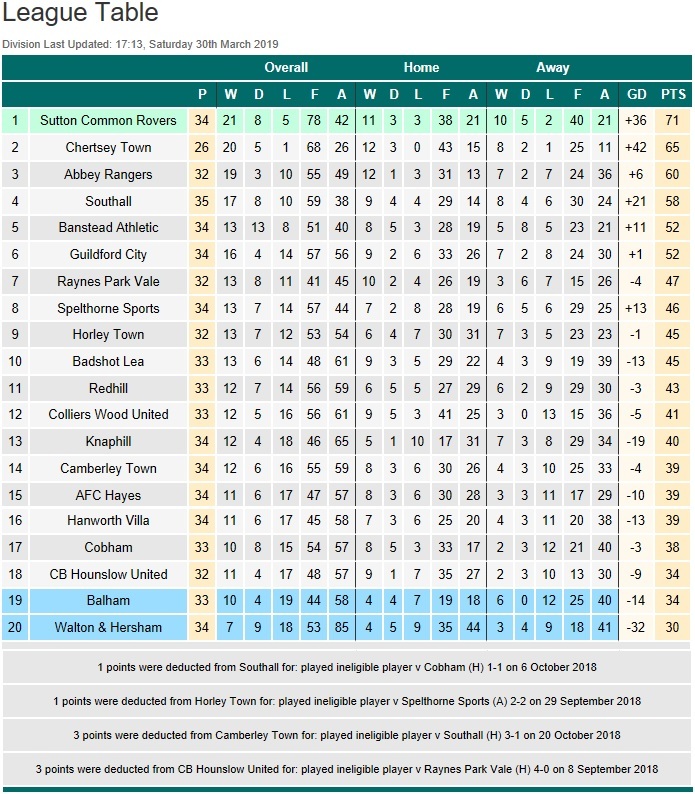 Then followed another three seasons of playing in other local leagues before they were admitted to the East & West Surrey League, which they won in their first season. 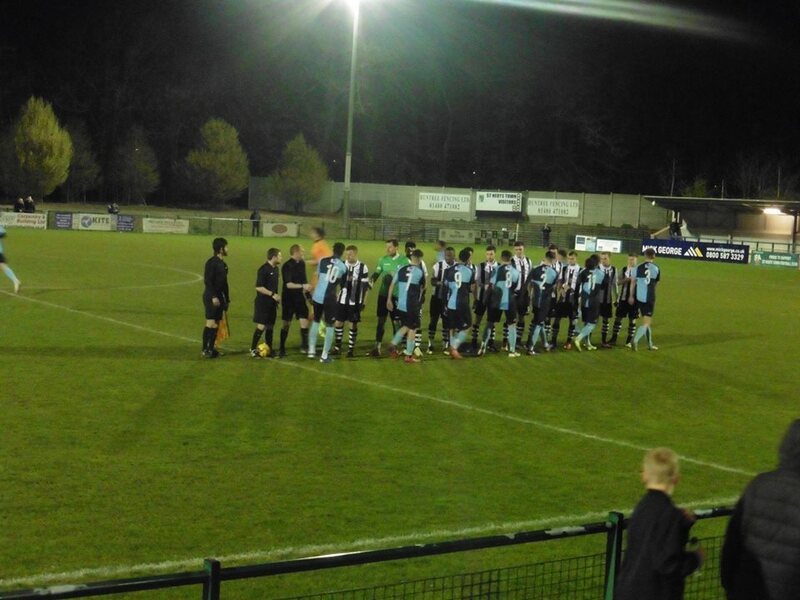 Two seasons later they reached the final of the Surrey Senior Cup final. 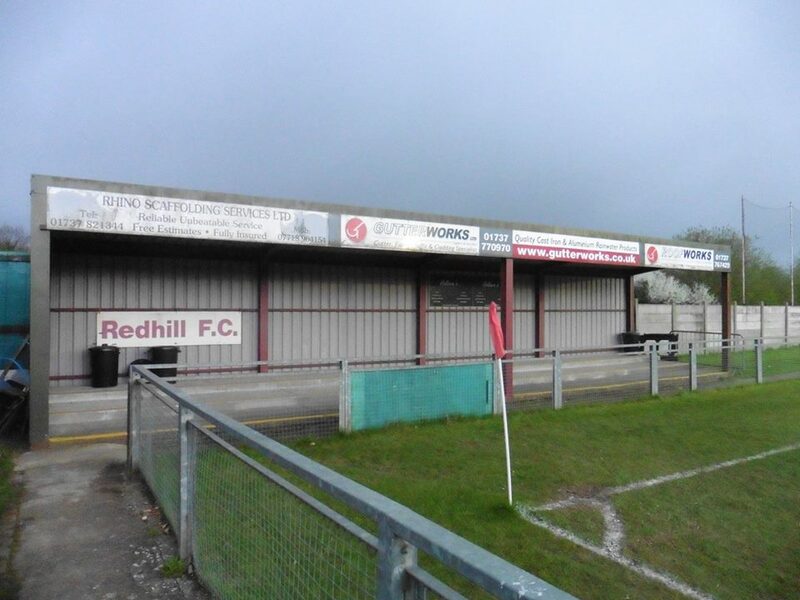 Redhill were accepted into the South Eastern League Division Two in 1906 and played in this division for three seasons, finishing fourth in 1908–09. They also finished 2nd in the Mid Surrey League during the same season.Following that they were 3rd in Sectrion A of the Spartan League in 1909–10. They then finished 3rd in the South Suburban West League in 1910–11, before becoming South Suburban Champions in the 1911–12 season. 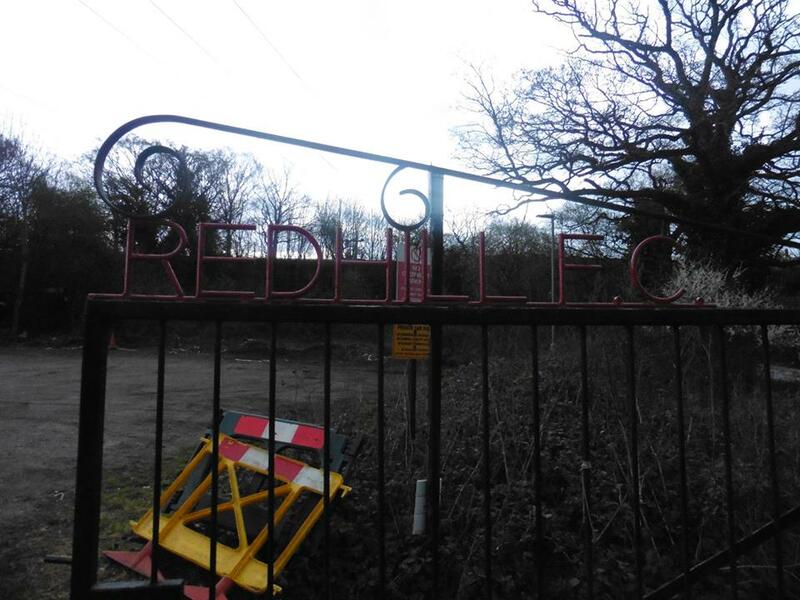 Redhill FC became London League members from 1921 to 1923, and finished runners up in their division at the end of the 1922–23 season. For the 1923–24 season they joined the Athenian League. 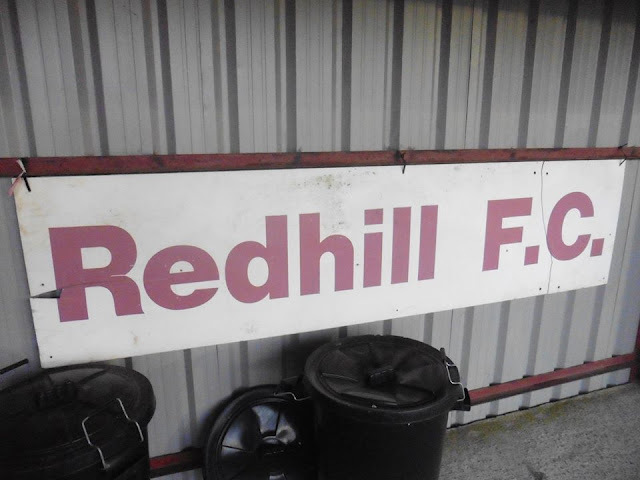 Redhill spent many years in the old Athenian League with such clubs as Barnet, Bromley, Sutton United and Grays Athletic. Fortunes were very mixed over the years, with Championships in 1924–25 and 1983–84. However, they also finished bottom of the league on several occasions: 1945–46, 1952–53, 1958–59, 1962–63, 1964–65 and 1977–78. 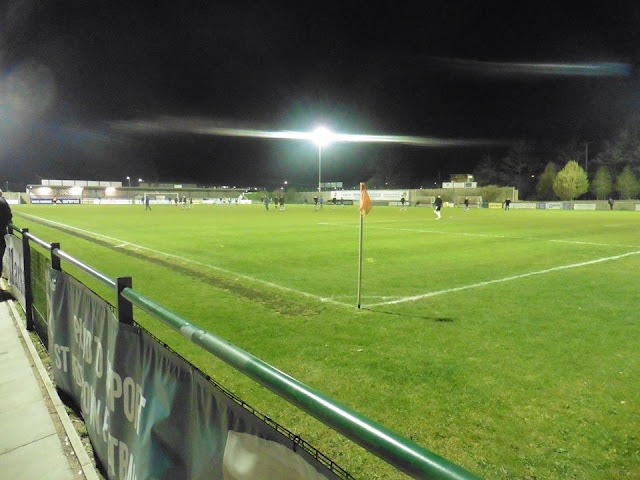 The club also won the Surrey Senior Cup in the 1928–29 season, defeating Epsom Town 3-2 at Guildford City's Josephs Road ground. 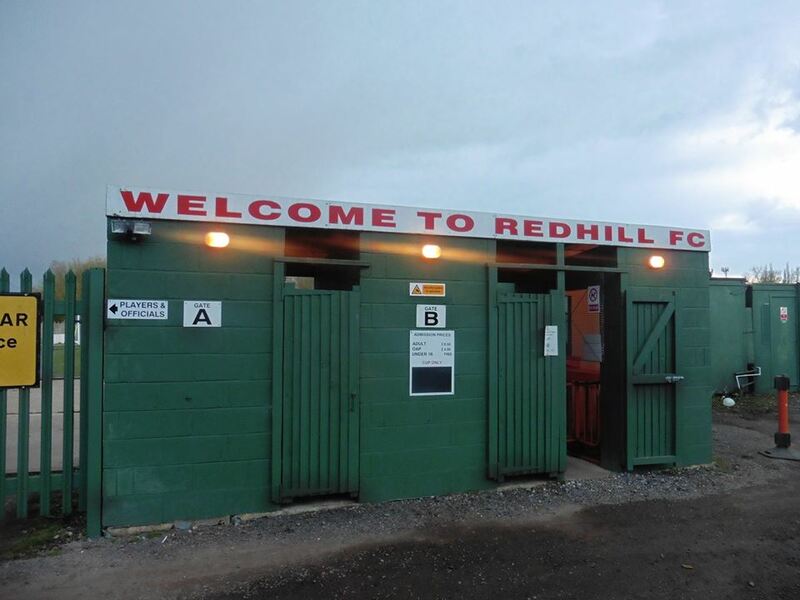 The 1st time Redhill reached the FA Cup 1st Round proper was in 1957, they were to be knocked out by Norwich City and took a great crowd at Norwich. 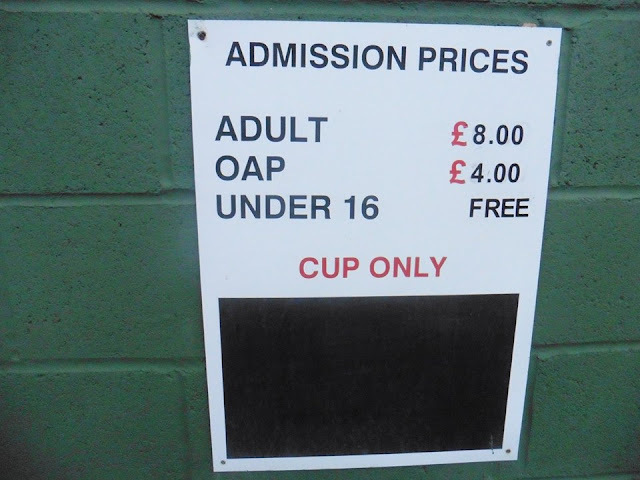 Norwich won the game 6-1 and you can see a copy of the match day programme, ticket and photos of the game in the clubhouse. In the early 80's, the club won the last ever Athenian League Championship in 83-84 and were due to gain promotion. 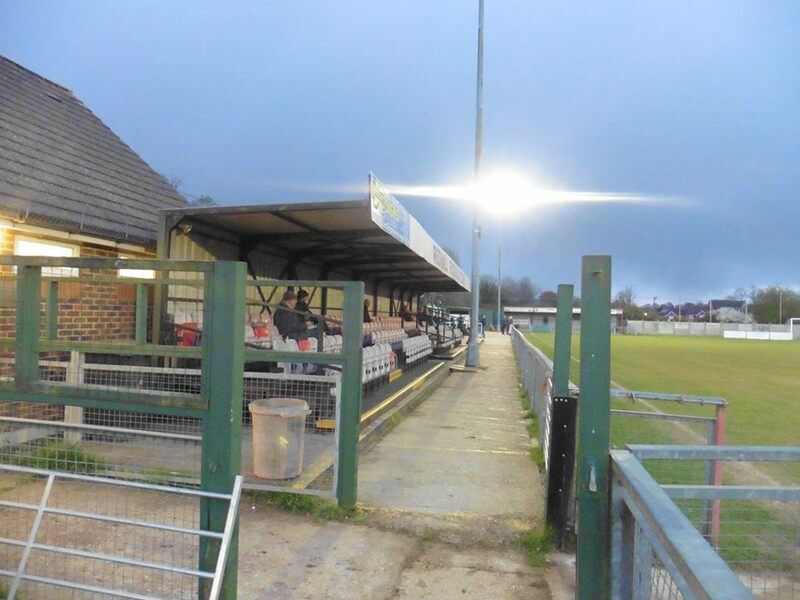 However, after being given notice to vacate their Memorial Sports Ground in the centre of the town, they were moved to Kiln Brow, situated about 2 miles to the south of the town. Without the required facilities, the club actually moved sideways in the pyramid into the London Spartan League. In 1996–97 they won promotion to Division One again by finishing third. 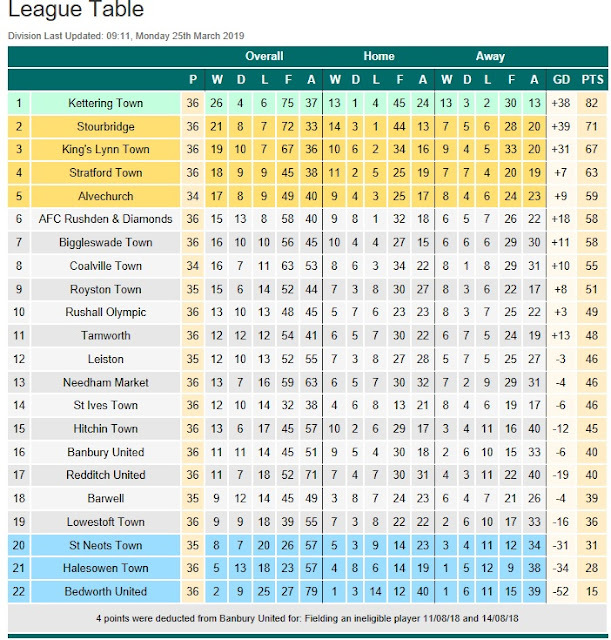 They finished fifth in their first season back in Division One, yet all subsequent positions have hovered around mid-table. In 2014–15 Redhill finished 23rd out of 24 teams in Division One South and were relegated to the Combined Counties League. 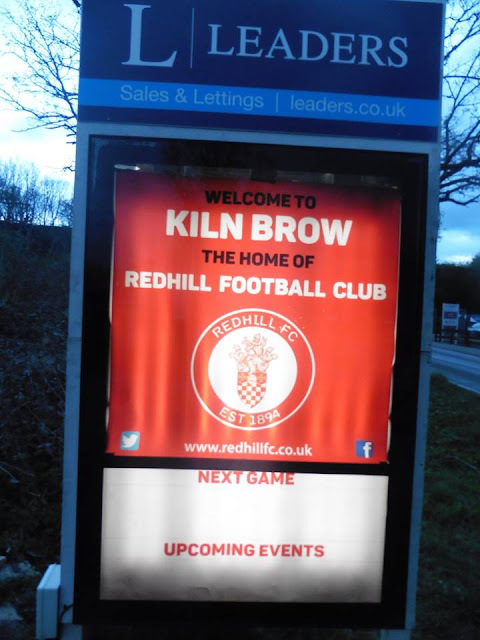 Visiting Redhill's Kiln Brow was always on my list to visit at some stage in my life, so as the game came about, it was only to be decided over the weekend after checking the fixtures on Non League Matters. Not much cropped up really, only another one could have stuck to local footy watching Tunbridge Wells v Glebe. As much as I do like watching Wells play from time to time, as the season draws close to an end, I wanted to try and tick off as many grounds as I can. For me Redhill itself crops up on 2 things, 1st one that reminds me of Redhill is a clip in Only Fools and Horses when Redhill gets mentioned as Del Boy goes hang-gliding with the end clip of Rodney asking where Del is, only for Trigger to answer back he was found in a TV Transmitter in Redhill, or something along them lines. 2nd thing is Redhill station I used to visit a lot in the past whilst changing trains to head towards my ex's parents place, luckily I don't miss on doing no more. So the week leading up to the game was quietish really. My last new ground was last week visiting St Neots Town, with a Gillingham home game on the Saturday against Rochdale in a battling 1-1 draw and then of course a visit to Redhill in mid-week. 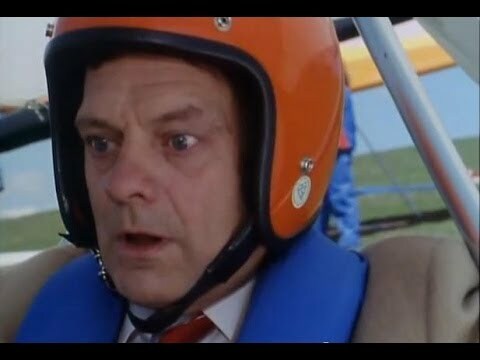 It was a week I am looking forward to at the end of the week, with payday followed by Peterborough United away with Gillingham followed by watching British Touring Cars at Brands Hatch. I hadn't been a follower of Touring Cars only up to recently watching races on YouTube last season, so looking forward to the weekend coming up. 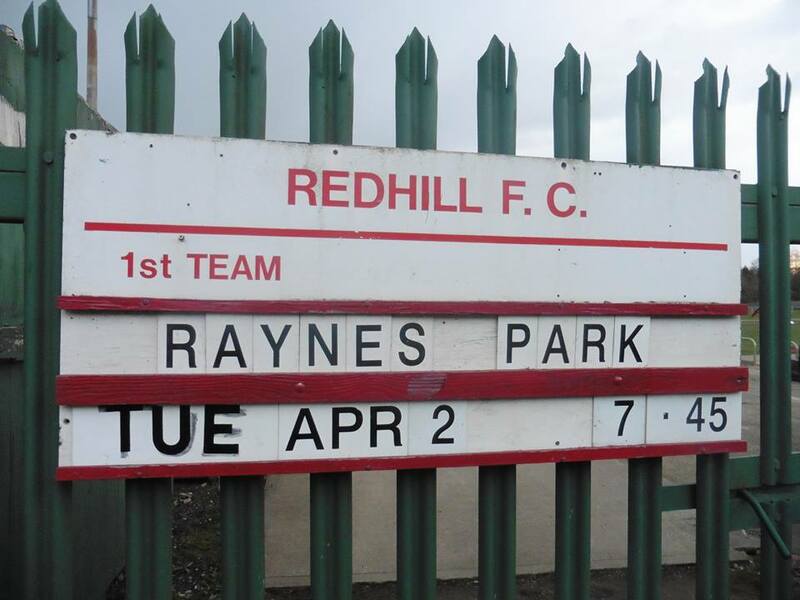 The day of the Redhill - Raynes Park Vale came and luckily I was able to get lift to the ground with Dad. Train was doable from home but with the journey in the car only taking about an hour, it was much easier to get a lift, and with the chance of getting offered a lift anyway, it was difficult to say no! After leaving home around 6.15pm, we arrived to the ground around 7.25pm. The route was a much changed one according to Google Maps, with Maps telling us to go on the M25 but luckily avoided it due to crashes apparently. 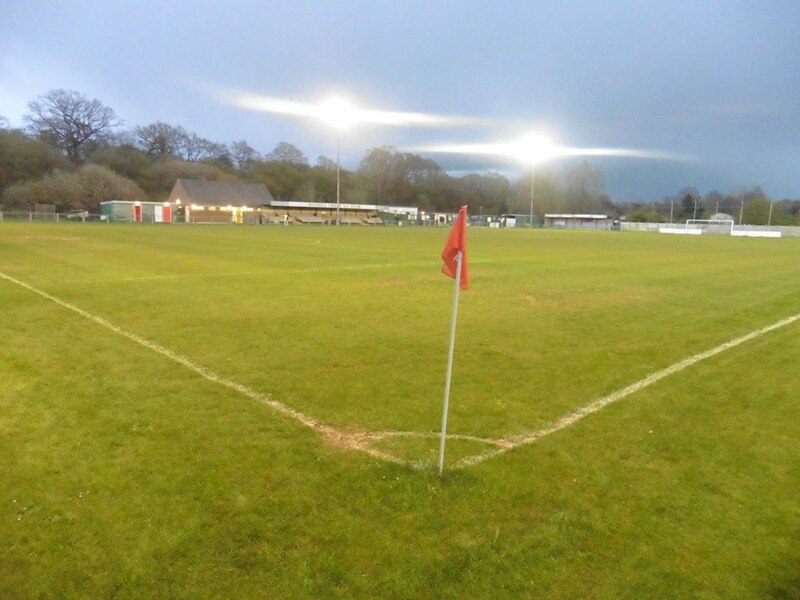 On the way, it was nice to be driving past Sevenoaks Town's ground, a ground I've been to a couple of times, latest watching Gillingham in a friendly there earlier on in the season. 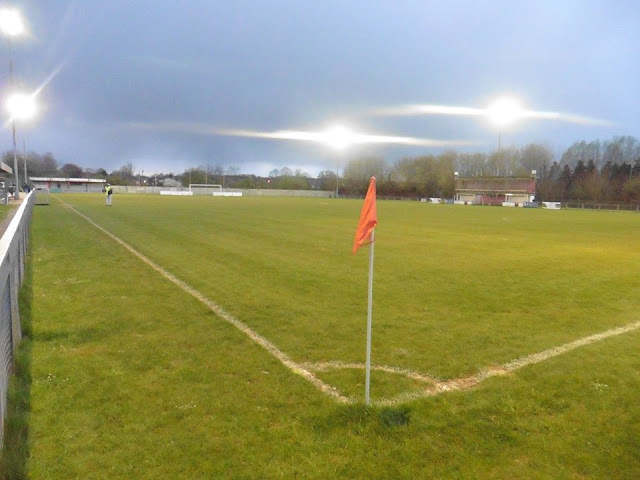 After taking photos outside and my usual lap of honour walking around the ground, the game shortly kicked off. 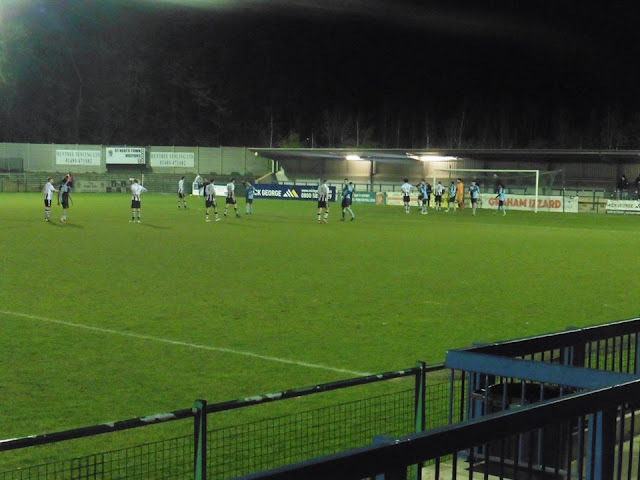 The 1st goal of the night came on 13 minutes with the visitors were awarded a penalty after a foul in the box which looked like no arguments from the hosts. 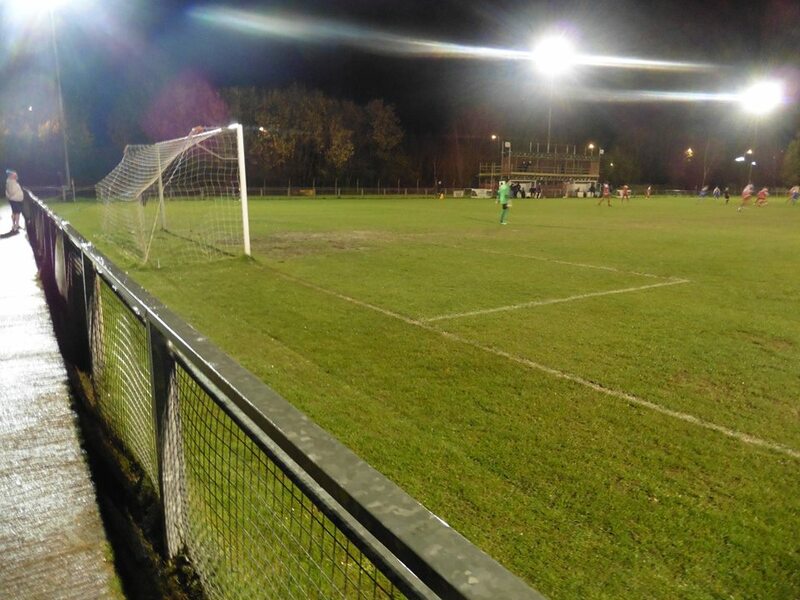 Jack Williamson scored from the penalty spot to make it 1-0. 2nd goal came a few minutes later, a tap in from Conor Turner. Redhill pulled one back which saw Sinatra Antwi get brought down after cutting inside and getting fouled. A stonewall pen for me personally, and the hosts pulled one back from Josh Greenleaf. 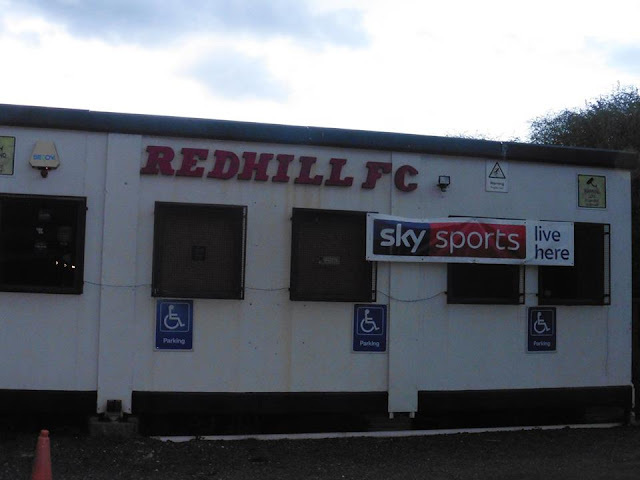 2nd half was pretty much non-existent which saw the visitors come away with the 3 points, which sees Redhill without a win now in 10 games. A quick mention goes to a couple of fans me and Dad ended up speaking to during the game, a Sheffield United fan who was a neutral for the night, ended up speaking mainly old players who played for both Gillingham and Sheffield United. 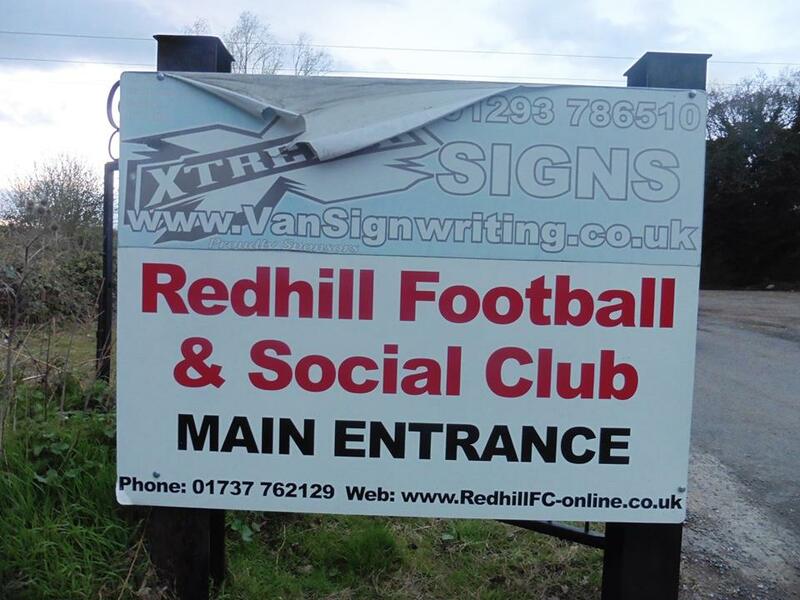 Another was a guy who's 1st team is Hull City, followed by Woking and now Redhill as he lives in the area which is a bit of an odd combination but then each to their own. Hull I've yet to tick off as part of the 92, hopefully to do next season. 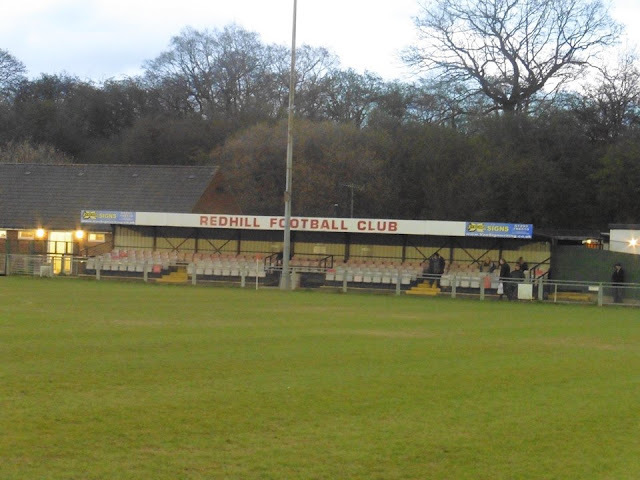 After the game I arrived home around 10.45pm, a decent enough night at Redhill which saw my 155th ground ticked off. Famous people to be known from Redhill are Liz May Brice actress known for playing in ITV drama Bad Girls, Michael Greco who played Beppe DiMarco in EastEnders, former Formula One Driver Max Chilton and former Cricketer Nick Falkner. Redhill have been playing at Kiln Brow since 1984 after playing at their previous ground Memorial Sports Ground in the centre of town. 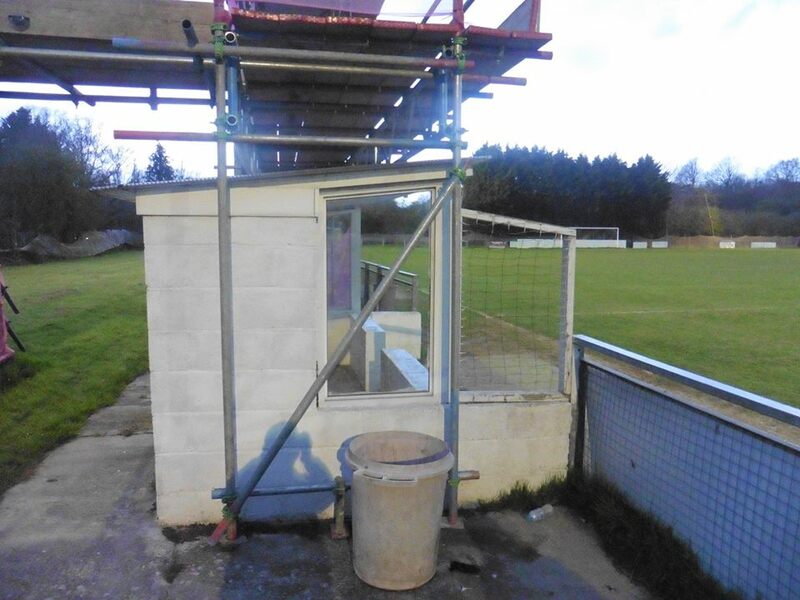 They were given notice to leave the Sports Ground and moved to Kiln Brow. The ground holds 2,000 with around 100 seats. 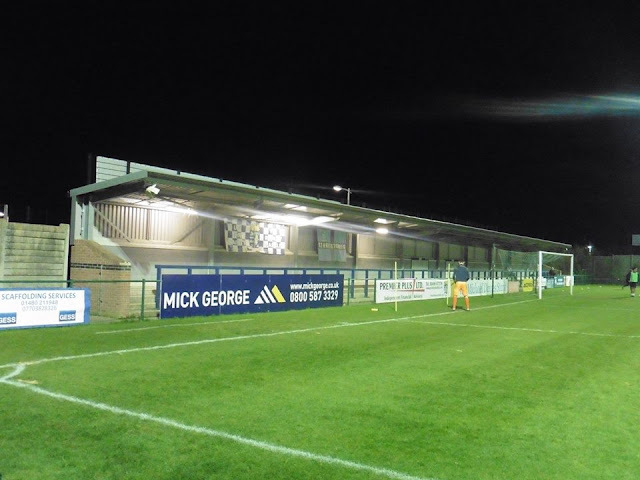 St Neots Town Football Club were formed in 1879. 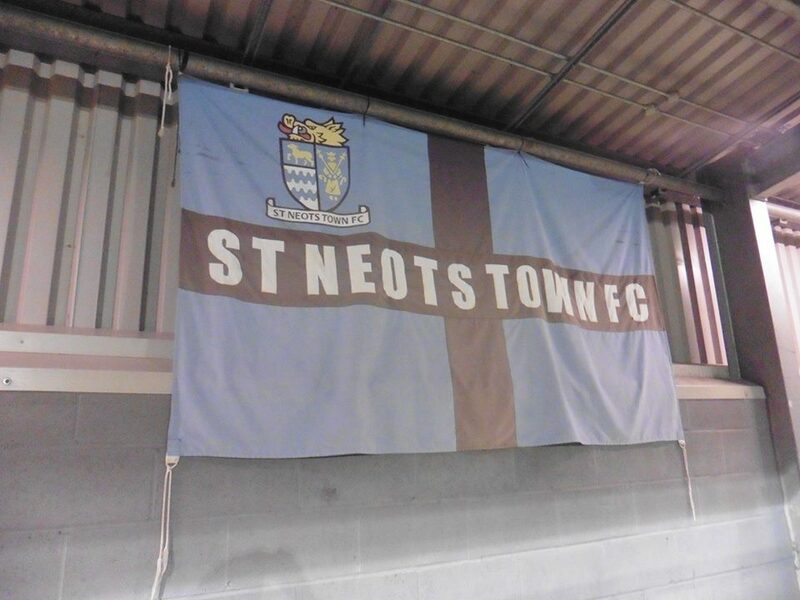 Back then they were just known as plain St Neots. 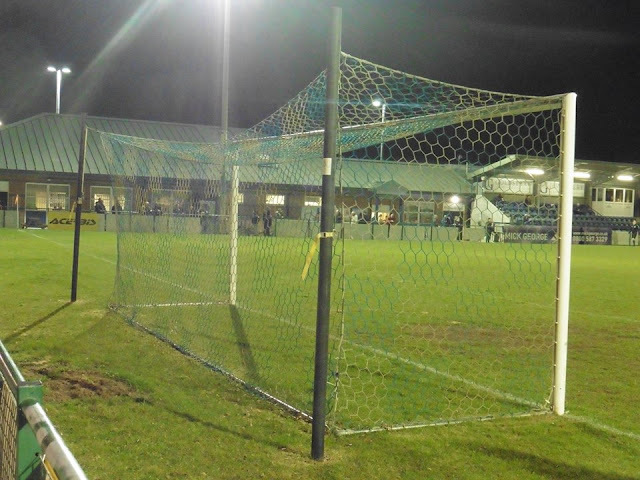 The club won it's 1st trophy by becoming inaugural winners of the Huntingdonshire Senior Cup in 1888-89. They went on to win the cup another four times before the turn of the century in 1892–93, 1894–95, 1895–96 and 1896–97. In the 1901/02 season the Club recorded its first known ‘double’ when it won the Hunts Senior Cup, for the sixth time, and the Fellowes Cup. During this period they played in the Biggleswade & District League. 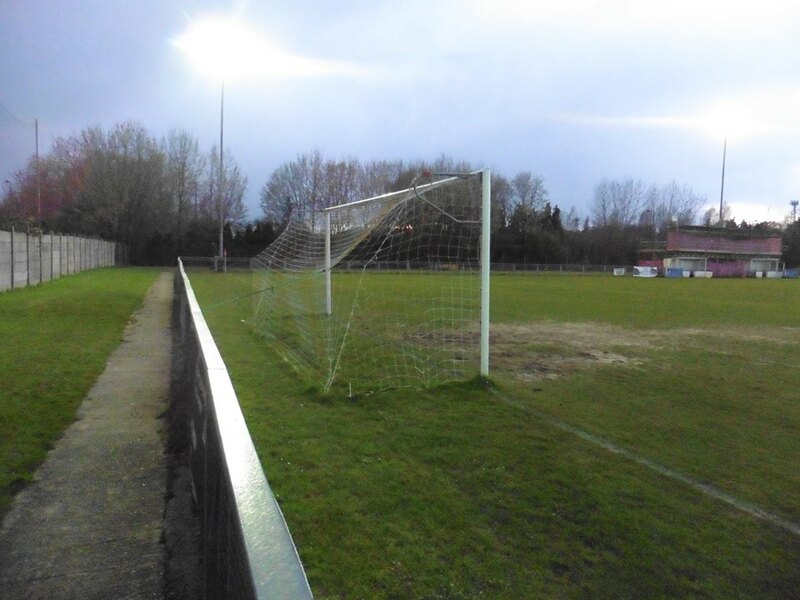 By 1927 they had joined the Bedfordshire & District League, which later became the South Midlands League in 1929. 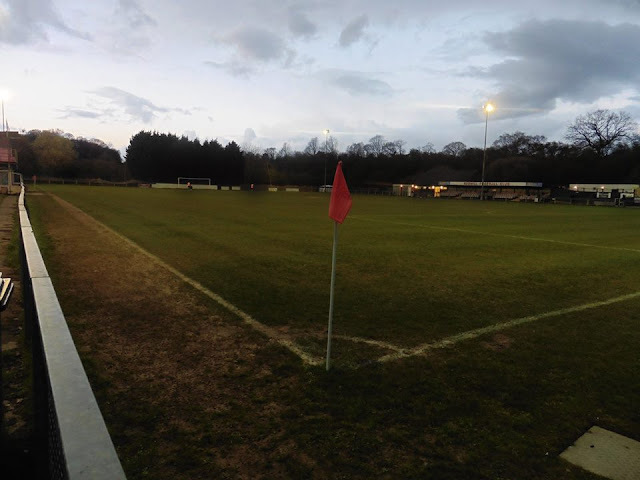 The South Midlands League title was clinched in 1932–33. 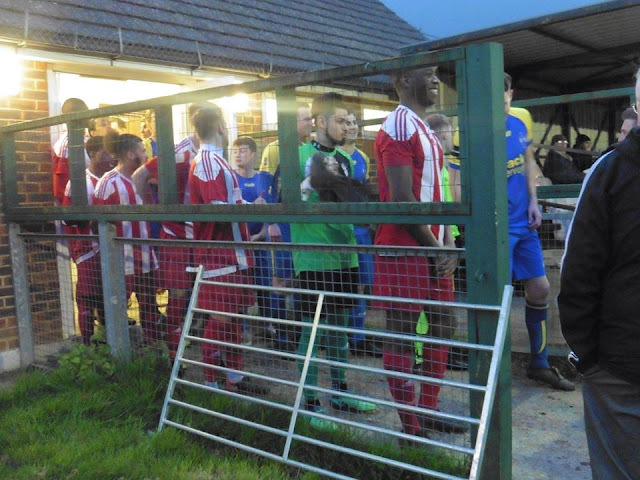 Progression came in 1936 with entry to the United Counties League, however after World War II they rejoined the South Midlands League, before becoming founder members of the Metropolitan League in 1949. They won the league and league cup double in its first season, but returned to the UCL in 1951. In 1956 they switched leagues again, joining Division One South of the Central Alliance. 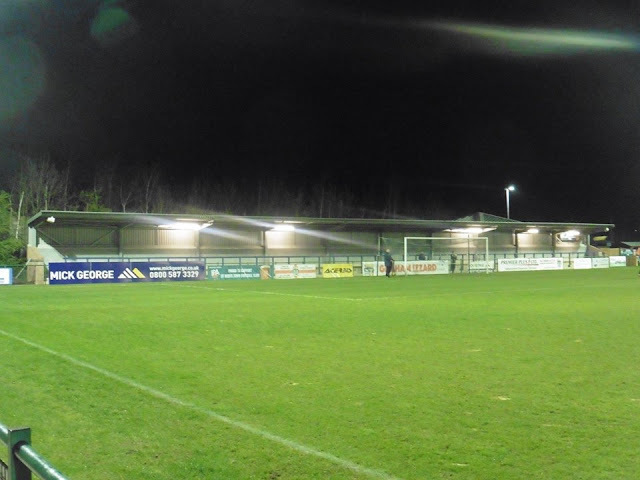 The following year the club was renamed for the third time to it's present name St Neots Town FC. 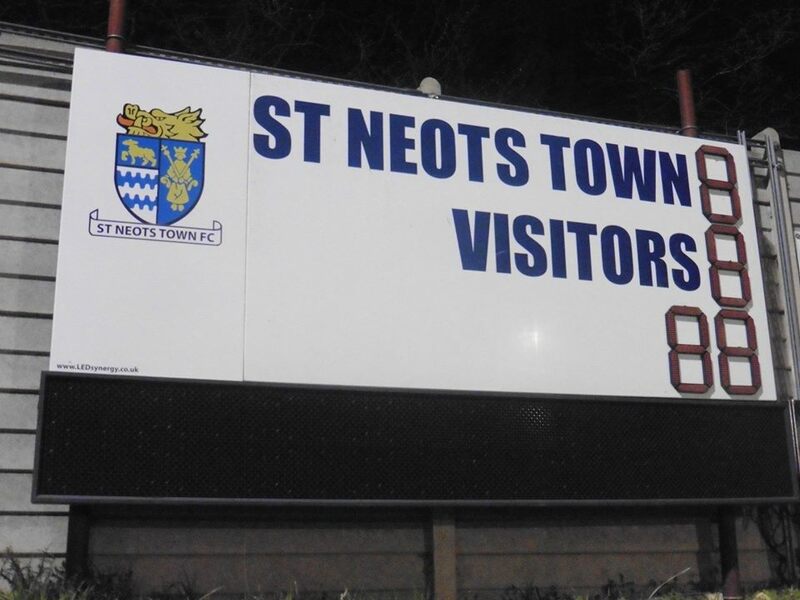 In 1966–67 St Neots enjoyed their best run to date in the FA Cup reaching the first round proper, where they were beaten 2–0 away at Walsall. 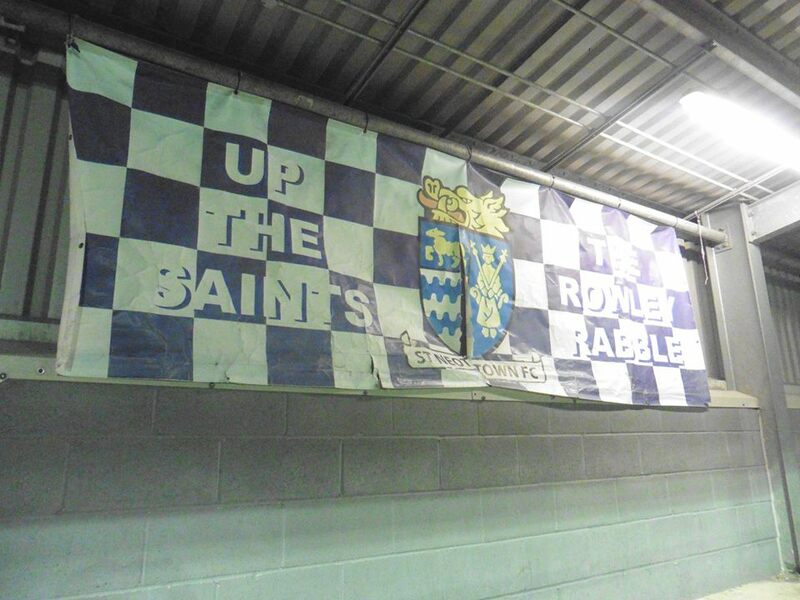 They went on to win the United Counties League and League Cup double in 1967–68 after re-joining the season earlier. The following season they retained the league cup and also won the Huntingdonshire Senior Cup for the twelfth consecutive season, a record for senior cups in England. 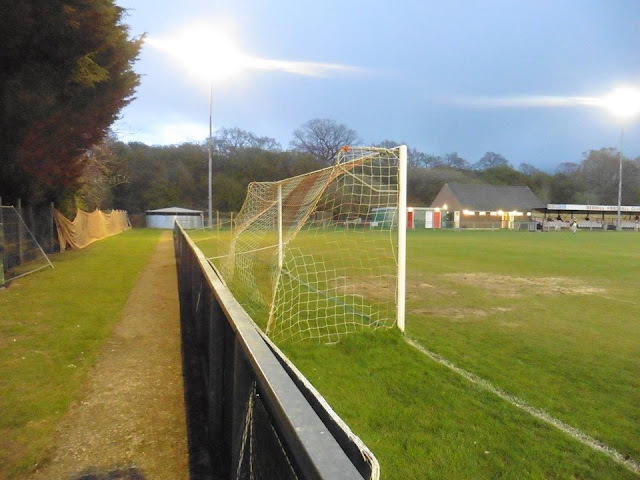 In 1969 the club transferred to the Eastern Counties League because it was felt it would be a stronger league, but returned for a fourth spell in the UCL Premier Division in 1973. During the 1987–88 season the owner of their long term home at Shortsands yard sold it to a housing developer, meaning the club had to finish the season on a sub-standard borrowed works pitch. 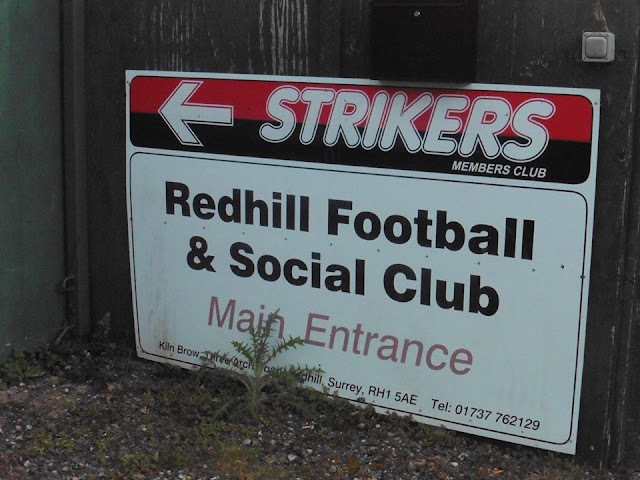 At the end of the 87–88 league season just four places from the bottom of the league table the club was forced to disband in order to clear its outstanding debt. 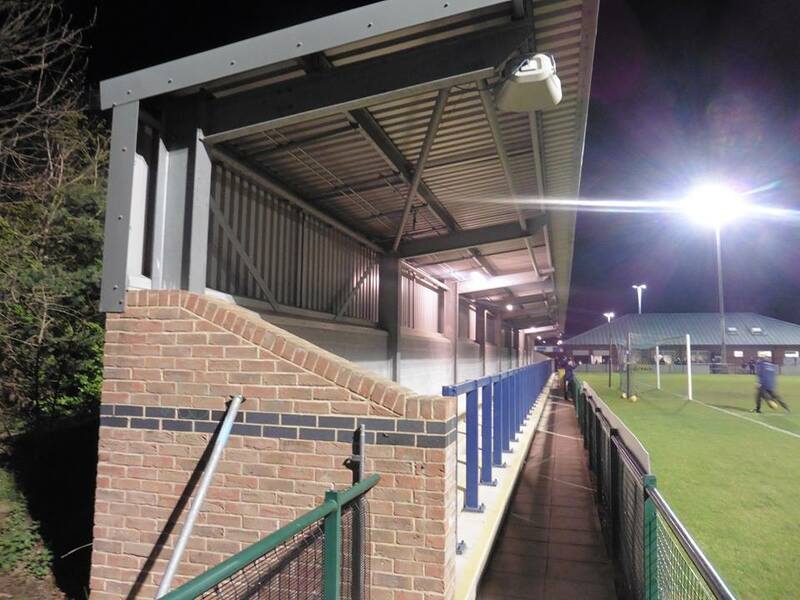 Out of football for just two seasons St Neots Town FC was reformed, when, in 1990, John Carroll and Bob Page invested large sums of capital into the club, they joined the Huntingdonshire Junior League, with a pitch at Priory Park, that was rented from the district council. After four consecutive titles and a six year absence from senior football, they were readmitted to Division One of the UCL in 1994. They won Division One at the first attempt and were promoted to the Premier Division, where they would stay for the next 17 years. The club's ambition to move on was shown with the 2009 addition of former Northern Ireland internationals Steve Lomas and Michael Hughes as a player managerial team, where they were joined by Sylvain Legwinski, formerly of Fulham. 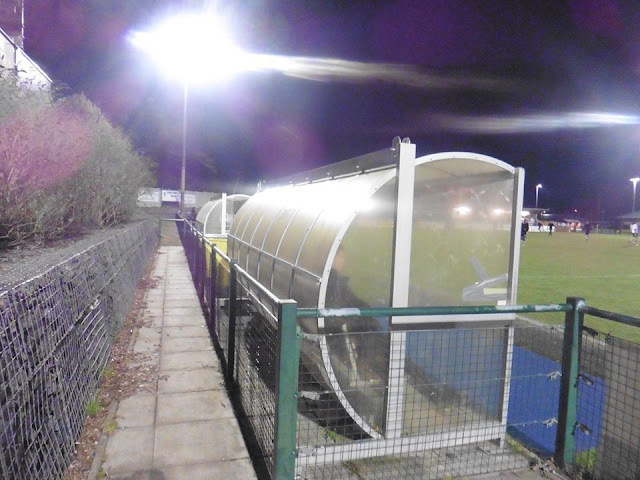 Whilst these star names moved on, new manager Dennis Greene was able to bolster his side in late 2010 with the audacious signing of former Aston Villa striker Stefan Moore, fresh from scoring 39 goals for higher-level Halesowen Town. 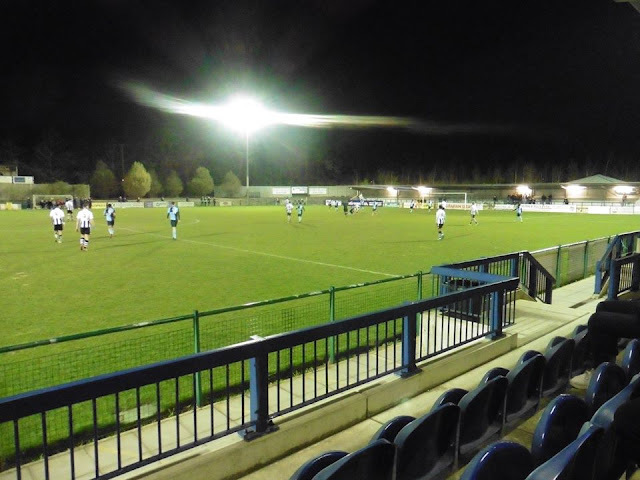 Moore helped fire St Neots to the 2010–11 UCL Premier Division title, with the club breaking a number of records on the way to promotion to the Division One Central at which they won as champions at the first attempt. 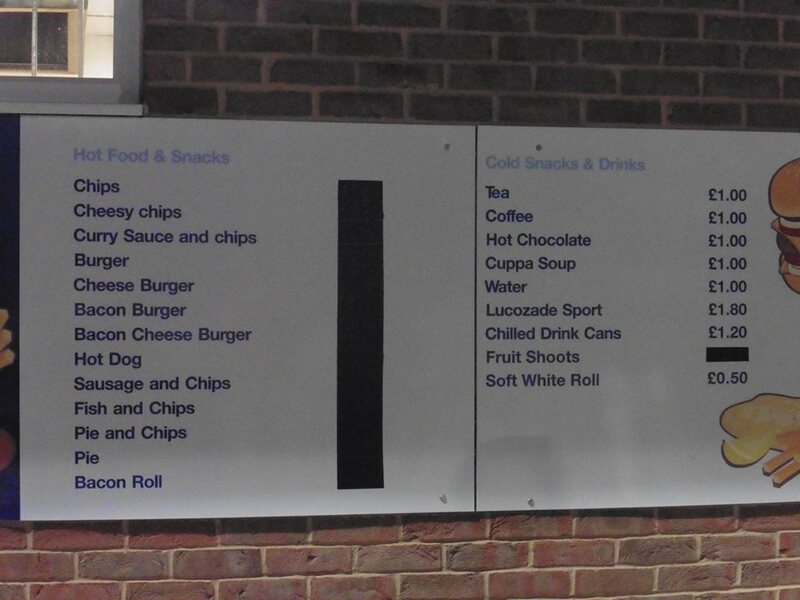 However, a series of management changes were to follow. At the start of the 2012–13 season manager Dennis Greene's position had become "untenable" leading to his resignation. 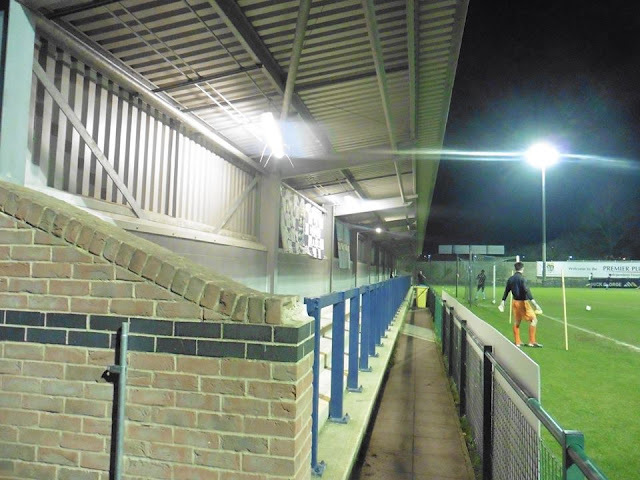 He was replaced first by Iain Parr, before a joint management team of Gary King and Zema Abbey were drafted in from Arlesey Town in November 2013. 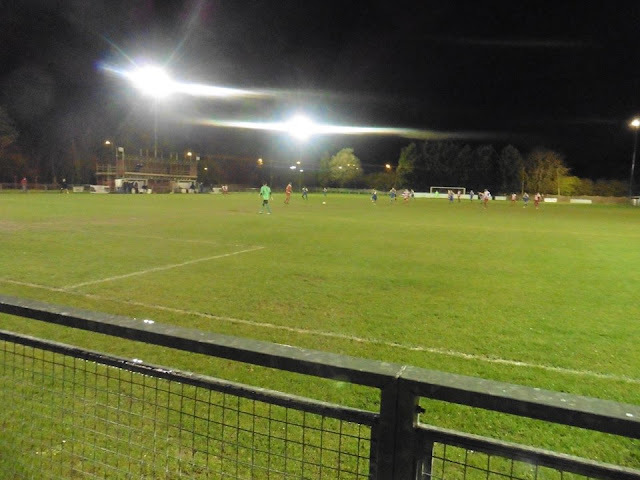 The new management team led the Saints to victory in the Hunts Senior Cup and the 2013/14 Southern Football League Cup, with victory over Tiverton Town in the final. Poor performances at the beginning of 2014–15 season however saw the Abbey brothers, Nathan and Zema relieved of their duties. Gary King became the sole manager, bringing in Liam George as his assistant and promoting Matthew Spring to player/assistant coach. King resigned in late December 2014, and was replaced by David Batch. 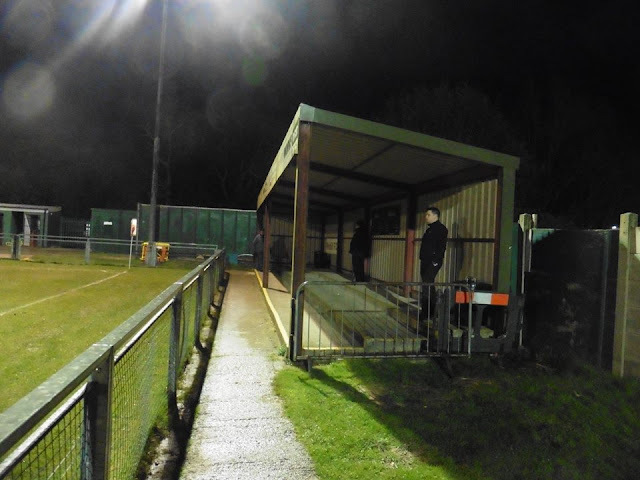 In December 2015, owner and chairman Mike Kearns stepped aside with his stake in the club acquired by the club's managing director, and Kearns' son, Lee. It has been a fairly quiet couple of weeks for me as both midweek fixtures Gillingham would be playing. 1st week was Bristol Rovers at home which ended being a disaster which saw the visitors come away with the 3 points with a 1-0 win. 2nd week was the Kent Senior Cup between Maidstone United and Gills, a long outstanding rivalry between the 2, and roughly about 20 minutes car journey wise. This would be our 2nd meeting between the 2 sides since Maidstone reformed in 1992 as last season Maidstone came out 2-1 winners, this time round Maidstone would again beat Gillingham this time on penalties. 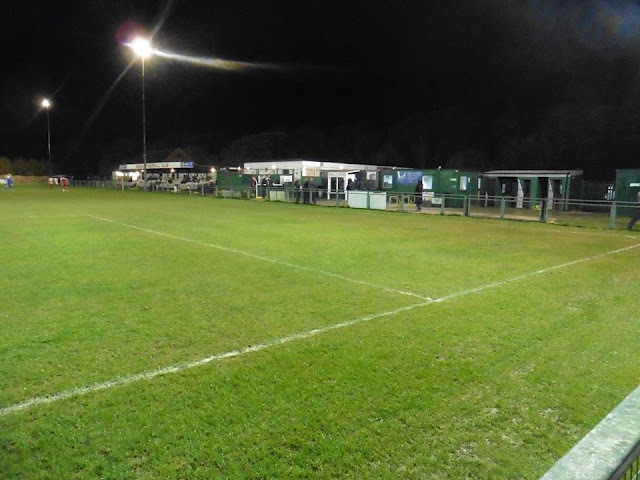 So the 2 weeks have gone, and I was very keen to get back into some Groundhopping and ticking off some more new grounds. I was toying with the idea of putting a poll up on Twitter, to let the lovely people of Twitter to decide for me on where to go and thought stuff it why not. After checking out the fixtures on Non League Matters, I came down to 3 fixtures, them being Clapton v Woodford, Glebe v Erith and of course St Neots v Coalville. 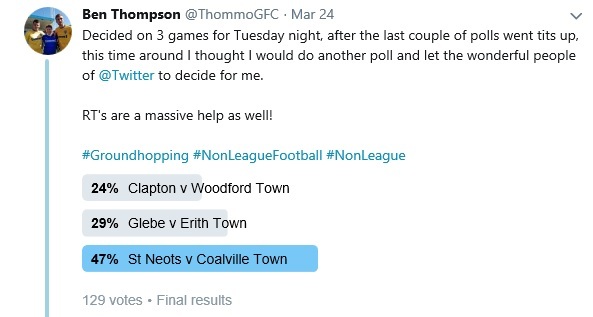 Originally my plan was to tick off St Neots anyway, but thought I'd put a poll up to spice it up a little bit. 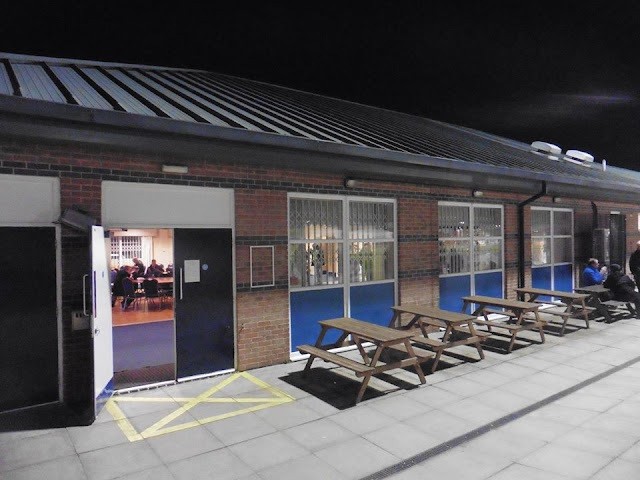 After 129 votes, St Neots won with quite a margin on 47% with 2nd being Glebe v Erith on 29%. 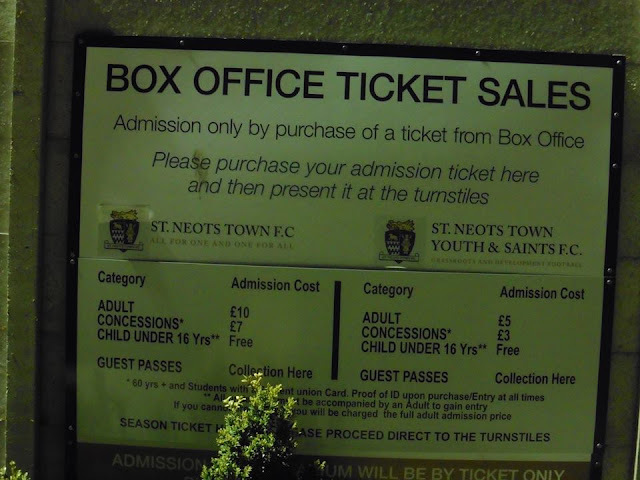 On the day of the game, I decided to start this blog up and look into the history of St Neots Town. 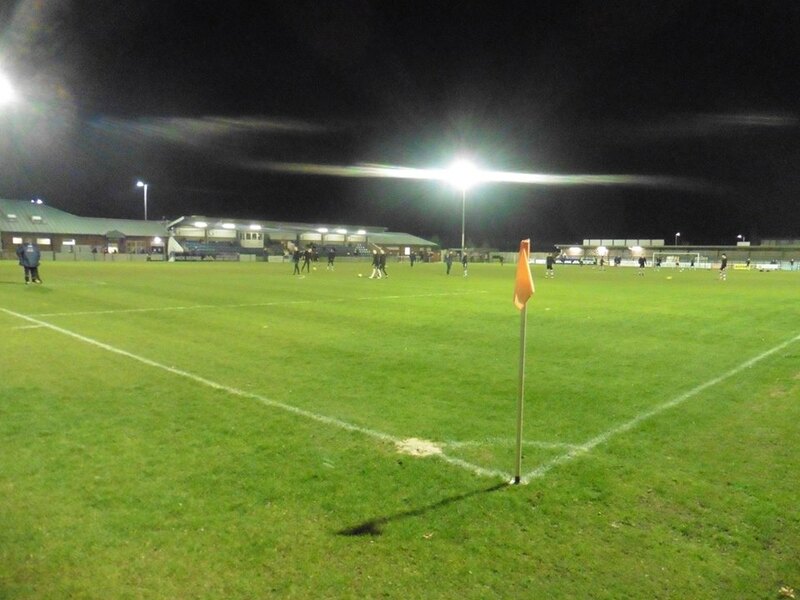 I never knew after Steve Lomas left Gillingham, he was to join St Neots as a player-manager at the club with alongside him former Northern Ireland international Michael Hughes and also joined him was former Fulham player Sylvian Legwinski. So after typing this up, I were to look at other hoppers photos of St Neots, and the ground looked to be fairly decent. So I left home shortly after 5, and arriving into London Bridge around 5.45. 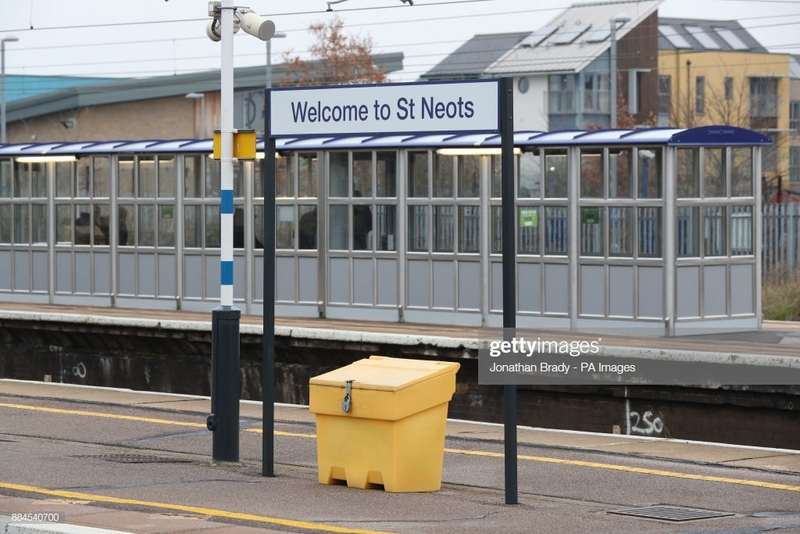 I didn't have too long to wait for my train, as I left London Bridge on the 6.01 train and eventually arrived to St Neots just after 7.10. A short walk from the station passing Tesco on the way and I was at the ground. 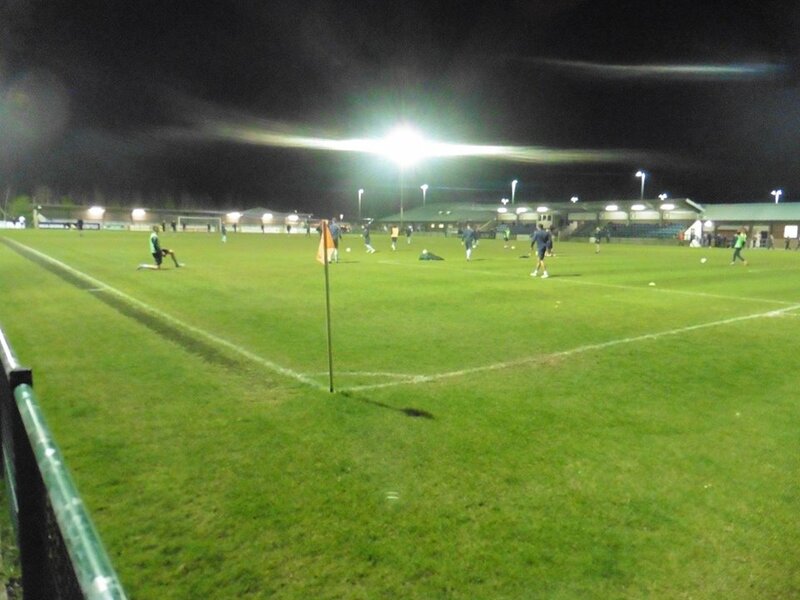 I would then do my usual lap of honour taking photos of the ground and would take to my seat. The game itself was a fairly decent game to watch. 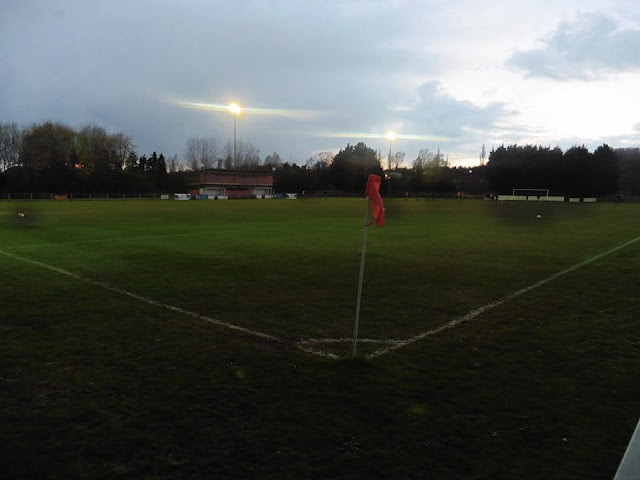 Coalville took the lead on 12 minutes through Andrew Wright's penalty, comfortably smashing the ball down the middle to make it 1-0. Half time came with Coalville looking stronger of the 2 sides, the hosts hadn't really threatened the goal too much. 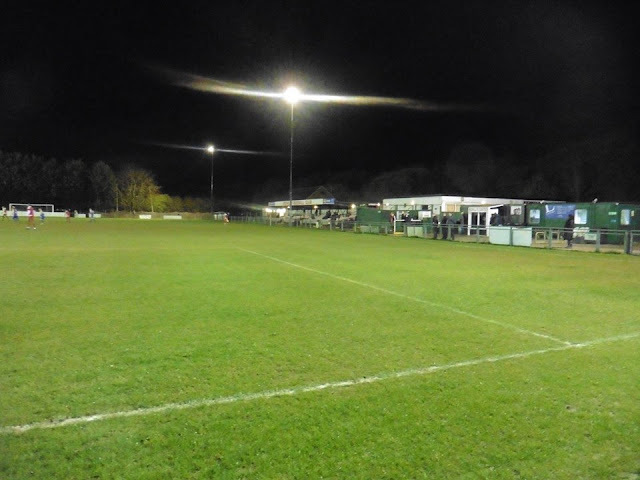 2nd half kicked off, and Coalville scored their 2nd just 5 minutes of the re-start when Coalville won a free-kick, a good cross from scorer Wright and was headed in to the far post by defender Kieran Fenton. Another goal 3 minutes later sealed the win, another free-kick which fell for Tim Berridge and he poked it into the net to comfortably make it 3-0. 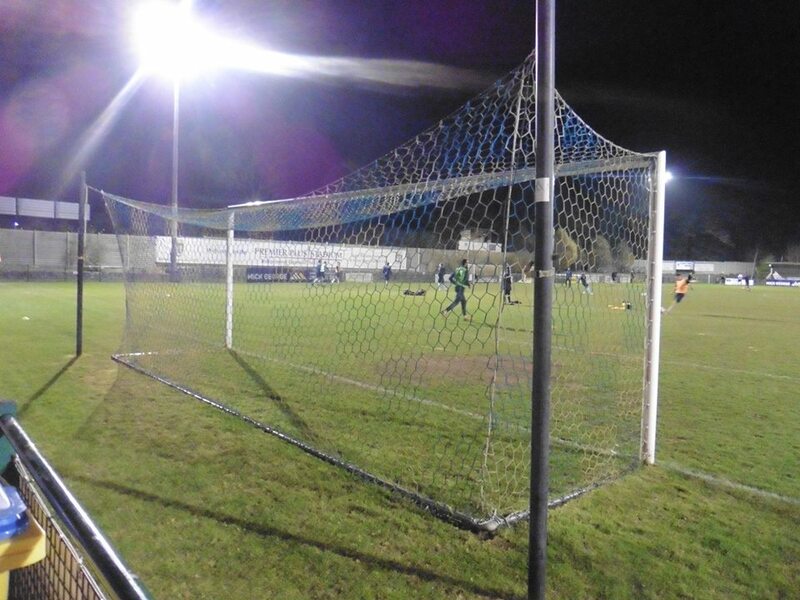 St Neots did pull 1 back from an own goal, an in swinging corner which visiting keeper Richard Walton misjudged and accidently punched the ball into the net. 4th goal I missed as I left a couple of mins early to catch my train but in the end it was an easy comfortable win for the visitors. 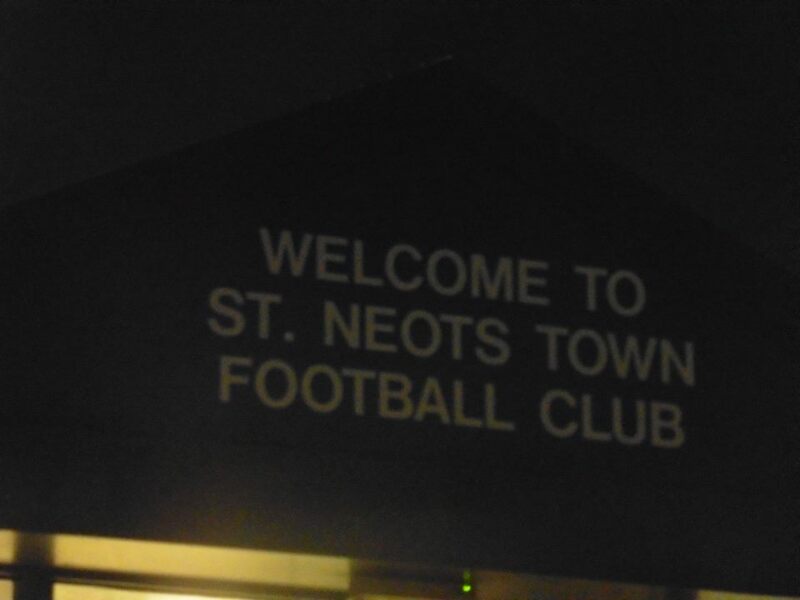 As I left St Neots on the train, I arrived home just after midnight. 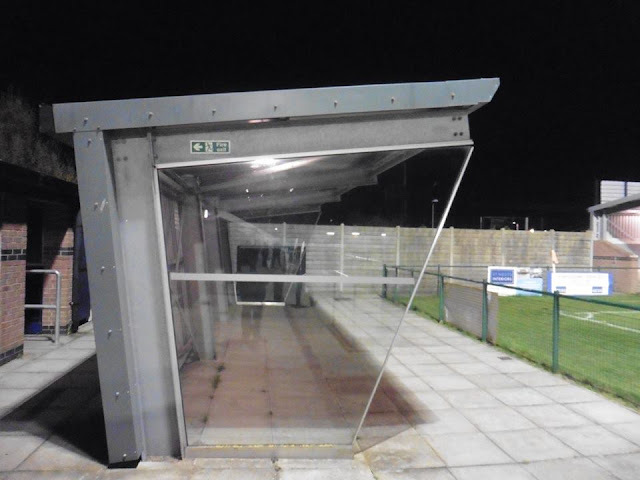 Coalville's penalty for their 1st goal of the night at St Neots Town. 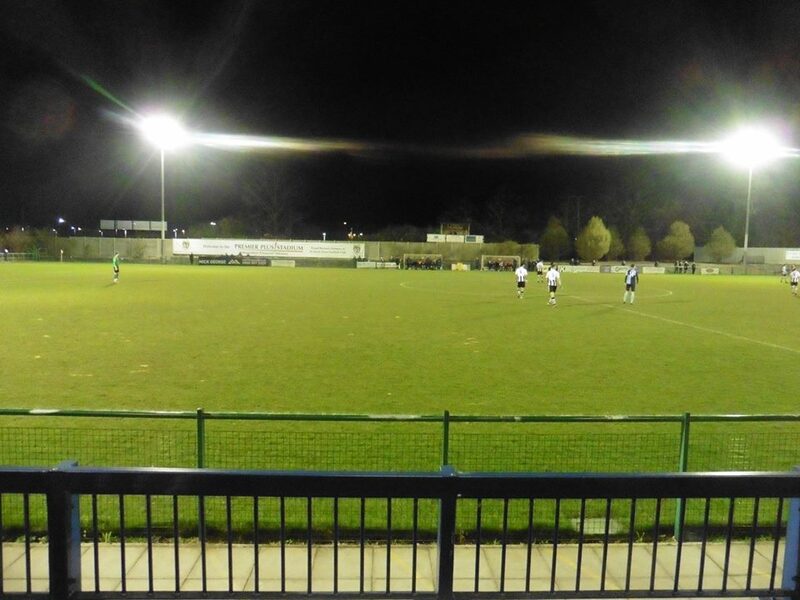 St Neots Town have been playing at Rowley Park since 1993 after playing at the Shortlands ground which was located in the town centre of St Neots. They would play there for 88 years before being evicted due to an outstanding debt. They would then move to Rowley Park with an Arsenal XI being the 1st opponents at the new ground. It was here they remained until the opening of the new Rowley Park in 2008. 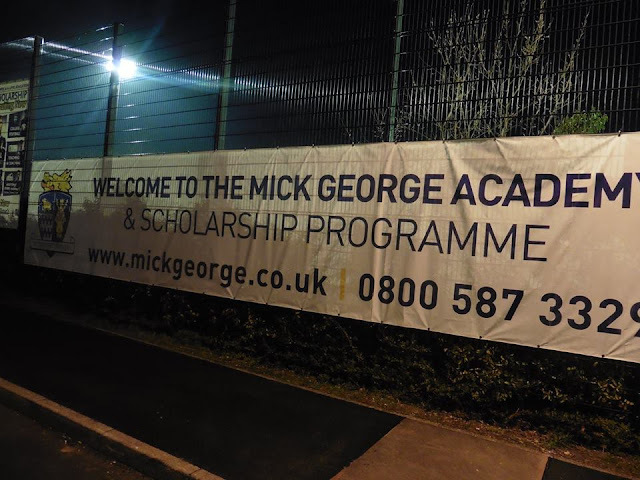 The multi million pound complex which incorporates the stadium, banqueting venue, Club Bar and full size 3G artificial training pitch was funded and constructed by the site developers Gallagher Estates, who were building 1,250 homes on the Loves Farm site, which included the existing football ground. 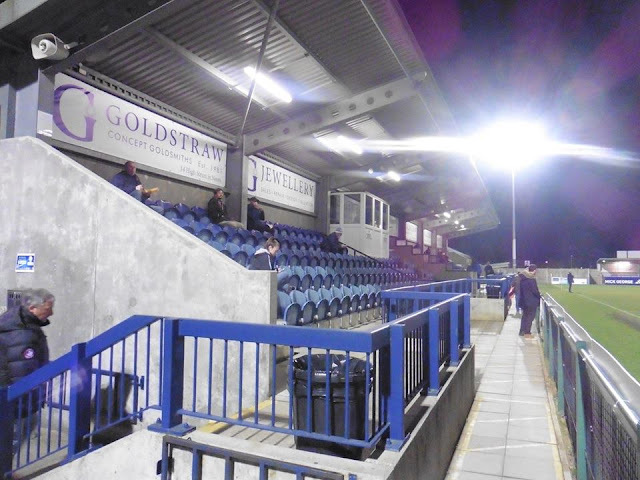 The ground holds 3,500 with around 250 seats. 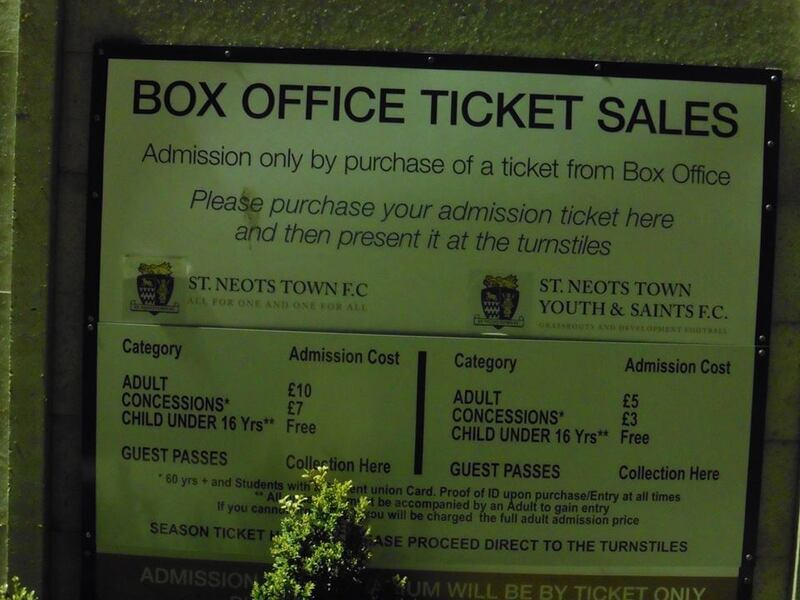 St Neots railway station is around a 5 minute walk to the ground.